RESPONSE Network has embarked on a programme to increase resilience among households that have children living with HIV in Zambia. Response Network’s programme manager says Julius Simfukwe says sensitisation of villagers in Kazungula, Zimba and Kalomo’s rural areas on child sexual abuse and gender based violence has been scaled up. “With the support of the Development Aid from People to People (DAPP) through USAID we at Response Network have a programme which seeks to increase resilience among households that have children living with HIV,” Simfukwe said. He said 719 villagers have so been reached in the first six months of the year out of which 363 were men and 356 females through goal oriented project planning workshops and meetings. Simfukwe said of the 719 villagers 10 persons living with disabilities have been involved with the funding by the Norwegian Association of the Disabled (NAD) and Academic Work of Sweden under Response Networks village Self-Help Programme. He said Response Network’s advisory board members Dorothy Velemu, Andrew Lwenje led by board chairperson Peter Matubulani were recently briefed of the networks programmes. “We informed the board that from USAID through Development Aid from People to People’s Zamfam Project we want to increase resilience among households with children living with HIV. So far 828 beneficiaries comprising of 263 males 565 females including 17 persons living with disabilities have been reached against a target of 7,028,” Simfukwe said. He said the project is aimed at achieving alleviated poverty through rights based self-help approach among the marginalised in Zimba, Kazungula and Kalomo districts. Simfukwe said under the HOPE programme two young women are working SMISO and Response Network on the child sexual abuse of children. 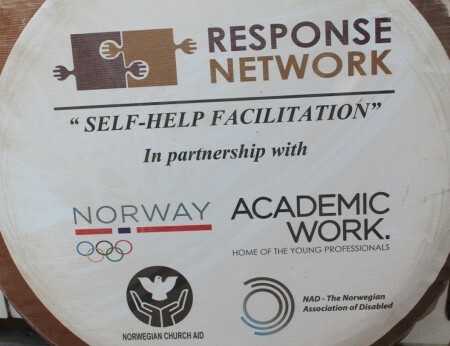 Simfukwe further added that through Academic Work, Tore Shulze Memorial and the Norwegian Olympic and Paralympics Committee and Confederation of Sport (NIF) staff, adding that the programme has over 700 girls being supported with school fees at both primary and secondary. “We have 20 young girls in tertiary learning institutions and 80 are undergoing skills training in catering, auto mechanics, electrical and tailoring, while 15 community members from various Response Network self-help facilitated clubs are undergoing skills training in agriculture and carpentry,” he said.